Picture UTSA one short decade from now rising to new heights as an urban-serving, Hispanic-thriving discovery enterprise considered a destination of choice for students. Our institutional mission, vision and core values provide the framework. They reflect who we are, what we do, and how we make the world a better place, now and into the future. Our current mission, vision and core values are currently undergoing review. A new statement on institutional diversity and inclusion is also under consideration. Peer models serve as inspiration. Everything we imagine is possible. We know this to be true because other institutions have done it before us. We have selected 10 peer models of excellence to serve as inspiration, all of which have ascended to new levels of excellence within a few short years. They provide a glimpse into UTSA’s future, providing guidance to chart our unique path for turning imagination into reality. Our destinations point the way. Based on input from internal and external stakeholders, as well as the UT System Board of Regents, UTSA has three overarching destinations that point us to the future. Our 10-year strategy rests on the core elements that define our very purpose and goals as a public institution of higher education. 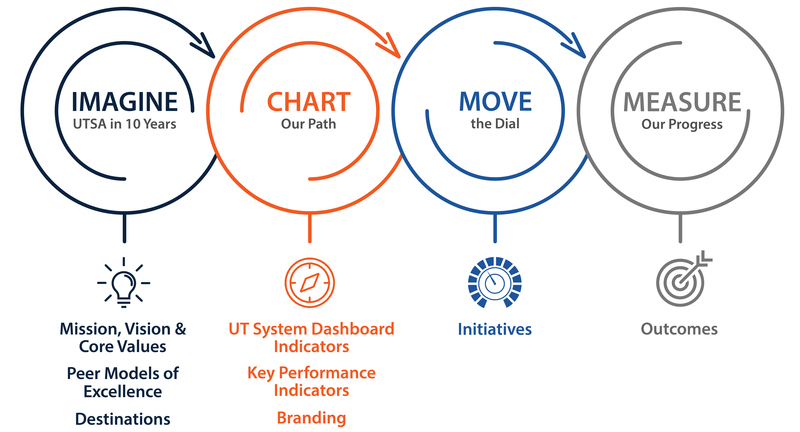 UT System's Dashboard Indicators inform our goals. Comparison metrics provided by UT System help us visualize where we need to go. Key Performance Indicators (KPIs) define what exactly we plan to accomplish. Our institutional KPIs pinpoint UTSA’s goals, facilitate operational awareness and allow us to assess our progress. Our institutional brand illustrates our promise. Messaging to our diverse stakeholders—future and current students, alumni, supporters, the San Antonio community and our local, national and international partners—illuminates the vision for UTSA’s future in compelling, creative ways. The path to achieving our 10-year vision depends on implementing strategies with the highest impact to get us to our destination. Strategic initiatives provide the route. Strategic initiatives are launched at regular intervals to drive us toward our three destinations and move us closer to meeting our KPI targets. A prioritization method helps to focus on those initiatives that have the highest potential for rapid progress toward the 10-year vision, within the context of resources, time, expense and sustainability. Depending on the level and scope of the initiative, it is categorized as Presidential, Strategic, Tactical or Operational. Each initiative is steered by an appointed task force or committee. Each strategic initiative is monitored and evaluated as part of our project management process. Assessment of outcomes provides direction for next steps. Data dashboards and annual performance evaluations form the basis of our assessment work, and inform the selection and prioritization of future strategic initiatives.